Designed to tackle the toughest terrain, Power-Mec flail mowers will clear the roughest grass or scrub-land and leave a tidy finish. 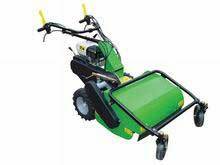 The machines are fitted with Honda GX series engines and this one gives a 900mm cutting width, Heavy duty transmission provides 3 forward speeds plus a reverse. The steering is aided by independent brakes to the rear wheels.